“The Bruce has theirs, this is ours,” says Tyler Hessel, owner of Outdoor Projects outtfitters www.outsideprojects.ca in Bayfield. He’s referring to the network of trails in Huron County; during my weekend, we mountain bike and hike through some gems. The plan is to join a series of these trails. 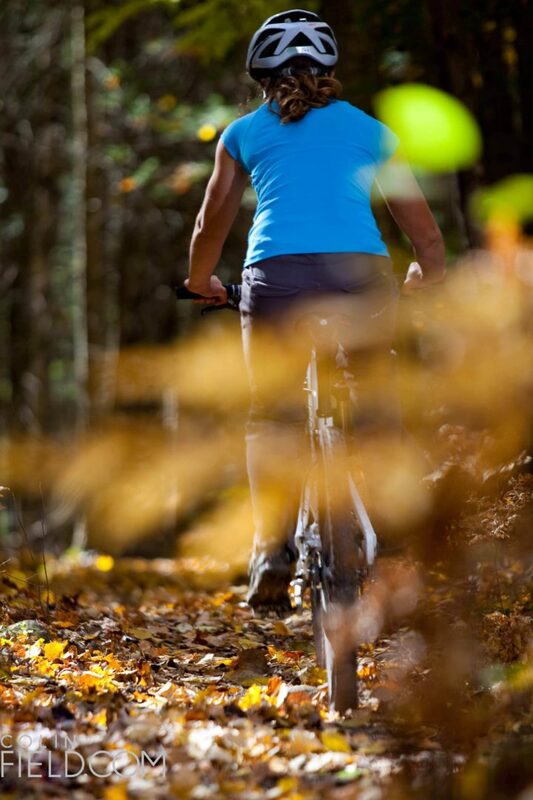 We’re on the Lobb trail–privately owned land that is maintained by locals. At the trail head, a wide road leading down, it’s so dense and dark at the end, I can’t see past the hill. We ride alongside the Maitland River–the largest river in the area. We dip into the woods and then spit out onto farmer’s fields. The fall leaves are a week before their colour peak: orange dominates the forest. Here is Tyler’s wife Heidi below. We plan to ride all morning but are stopped, abruptly, by downed trees. Apparently the tornado that hit Goderich, north of here, came down the river. We have no choice but to turn back. I’m shocked by the destruction: it looks like a clear cut. We’re quiet as we take it all in. This side of the river once looked like the other side: lush and full. My next post will talk about road riding; specifically how the rolling smoothness made this mountain biker reconsider the whole road thing. A mighty big feat.